(SPOT.ph) Half-asleep, you are bargaining with yourself. Denying it doesn’t make Monday a work of fiction. It’s real. It’s the day of the week we love to hate – perhaps because we don’t find good reasons why we shouldn’t. Let’s make Mondays great again, shall we? Here are five awesome things that should give your Monday a brand-new perspective. Clean record means fresh start. Wake up, it’s the first day of the week! It’s the time to redeem yourself from the mistakes and negative vibes of the past week. It’s not a manic Monday, it’s a no-panic Monday. The things you failed to do the other week, you have a clean slate on your plate today; make the most out of it. It’s the best day to conquer those weight-loss goals, pending office tasks, and unsolved little arguments with your SO over the weekend. Opportunity to set week’s mood right. Chapter 1 of 7: Setting the Momentum. Monday is the prime mover of the week. You don’t need a Physics degree to understand the concept of momentum – when you get the ball rolling right, it will go to the direction where you want it to be. Monday leaves us that ball in our park, and it is up to us how we want to dribble it. If last week your ball went south, that doesn’t matter anymore; there’s a new chance for you to make your way out of the BV zone. Not the saddest day of the week. Are Mondays really the worst? According to a study, office people are not the moodiest and most unhappy during Monday but Thursday. So, don’t believe the Monday blues; it all depends on how you want your first day of the week to be. After all, it’s only four days away from the weekend. Go against the flow. Most people do their shopping on weekends and when the calendar hits Monday, they are already too tired for after-office strolls. If you are no fan of literally rubbing elbows with other shoppers, then Monday is the best day for your mall errands. Roaming around your favorite mall minus the massive crowd is a pleasure. The Original Ice Blended® is only Php 100. The perfect way to end your bed's clingy behavior during Mondays is coffee. The guys who invented The Original Ice Blended® drink, The Coffee Bean & Tea Leaf®, gives us another legit reason to love Mondays. 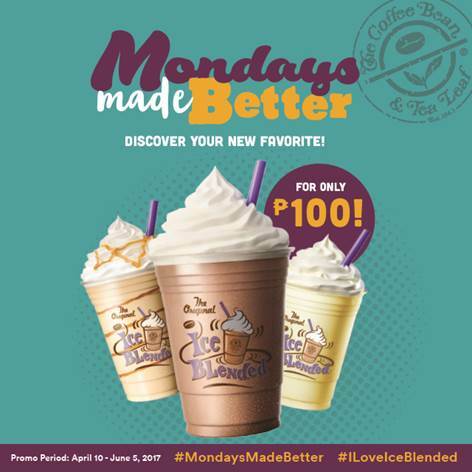 The Coffee Bean & Tea Leaf®'s Mondays Made Better is letting us have their regular sized featured beverages for only Php 100, from store opening until before midnight. They announce the featured beverages every Friday on their social media pages so you can start the week with the original favorite drink! This promo starts from April 10, until June 5, 2017 so make sure to plan your Mondays right. We feel you, Mondays are always hard to understand, but when you have these things to look forward to, you will have a renewed relationship with it. Celebrate the start of the week and discover your new favorite every Monday with #MondaysMadeBetter. This article was created by Summit Storylabs in partnership with The Coffee Bean & Tea Leaf®.